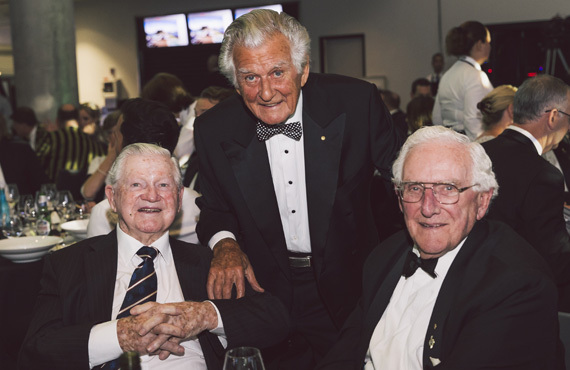 Bradman Gala Dinner: November 2019 | The International Cricket Hall of Fame. Email Jecca for more information! 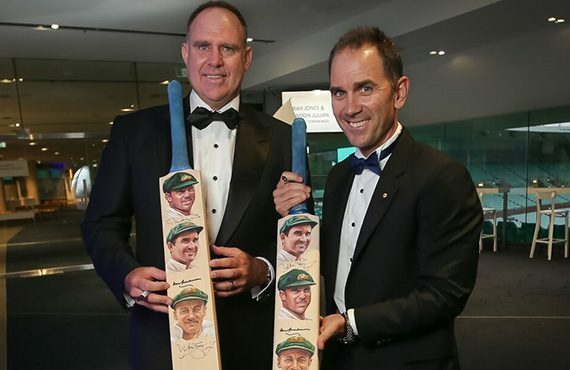 On Wednesday, 29 November the Bradman Foundation inducted both Justin Langer and Matthew Hayden as 2018 Honourees. They were humbled by the tribute delivered by their former Test Captain Ricky Ponting. In response, both players talked about their mateship and values that sport can deliver when two individuals are in tune with each other as these two were when they were opening the batting for Australia. It was a pleasure to listen to Patron John Howard talking about the great value of sportsmanship and mateship which is fundamental to Australia’s culture, developed as a result of our nation’s ability to perform on the world stage across many sports. 9 graphic banners with images of all our Honourees will be returned to Bowral and be hung in the international gallery of the Museum in readiness for a busy January visitation. Matthew Hayden & Justin Langer are the 2nd most prolific Test opening partnership* in Test match history with 5,655 runs made for Australia between 2001 – 2007. Their partnerships averaged 51.41 runs. Together they were not out 3 times. Hayden was big, brooding and bullied the bowling. In contrast Langer was deft, swift and fiercely competitive. The pair consistently manifested on-field grit and mutual respect, their batting always expressing a palpably instinctive understanding. The pair hold the 31st highest opening partnership stand in Test cricket with 255 runs (made v Sri Lanka at Cazaly’s Stadium (Cairns) on 9 July 2004). Together, as opening batsmen, Hayden & Langer represented Australia in 113 Innings commencing with England (at The Oval) on 9 August 2001 (158 runs). They shared partnerships against New Zealand, South Africa, Pakistan, West Indies, Bangladesh, Zimbabwe, India, Sri Lanka & ICC World XI (2005). They played under three Australian Captains, Mark Taylor, Steve Waugh and Ricky Ponting. Their final partnership was made at the SCG against England on 2 January, 2007. Here they were undefeated scoring 46 between them to win the match (Langer 20*, Hayden 23*). Against India they have batted 16 times (2003-2004), aggregating 714 runs and averaging 44.63. Their highest partnership was 147 runs at the SCG on 2 January 2004. Their only other century partnership against India was 136 runs made at Chennai on 14 October 2004. However it was England that they batted together most against (28 times). Between 2001 & 2007 they aggregated 1,413 runs at an average of 54.35. Their highest stand was 195 runs at the MCG made on Boxing Day 2002. Justin Langer retired from Test cricket in 2007 and Matthew Hayden in 2009. 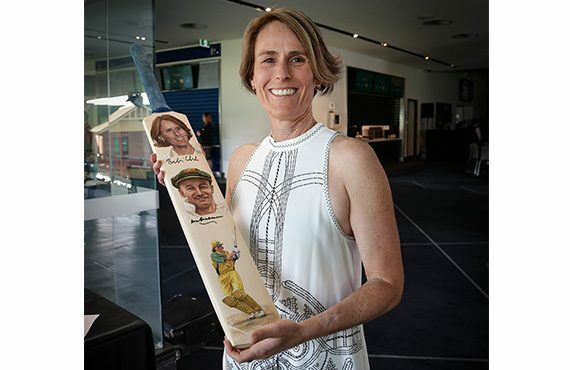 The Bradman Foundation Chairman Maurice Newman AC was pleased to announce that former Australian Captain Belinda Clark AM is the 2017 Bradman Honouree. Belinda is an outstanding servant of the game and her leadership on and off the field over 30 years will be acknowledged at the annual Bradman Foundation Gala Dinner being held at the SCG on 8 November. Initially selected for Australia at the age of 21, the Newcastle born Clark represented Australia over a 14 year period. During an exemplary career, Clark played 15 Tests scoring 919 runs at an average of 45.95 with 2 centuries and 118 ODIs scoring 4844 runs at 47.49 including 5 centuries and 30 fifties with a highest score of 229. As a captain, Clark’s record was exceptional, winning a total of 84 from 101 international matches played, including two ICC Women’s World Cup titles 1998 & 2005. After retirement, Belinda was inducted into the ICC Hall of Fame in 2011, the Australia Cricket Hall of Fame and New South Wales Hall of Champions. Off the field Belinda moved into administration as Chief Executive of Women’s Cricket Australia, managing the successful transition to full integration with Cricket Australia. In addition Belinda was appointed to the ICC Women’s committee and was one of the driving forces behind developing the concept of a multi-format Women’s Ashes Series. Belinda is currently a valued senior executive with Cricket Australia charged with the development and introduction of new junior formats across all states and associations. Bradman Honourees include a distinguished list of past players who have been acknowledged for their contribution to upholding the values of leadership that Sir Donald Bradman believed necessary to protect and respect the game and its character building qualities. 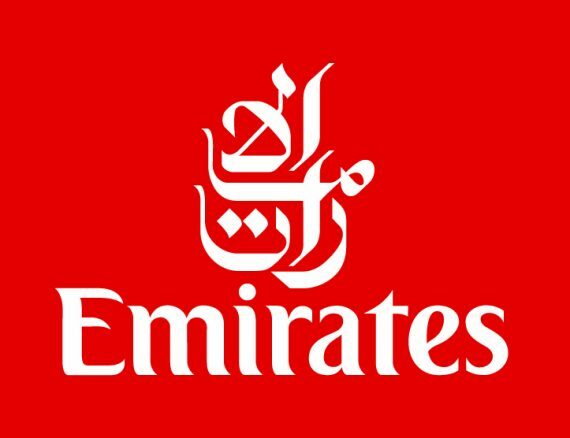 CONGRATULATIONS Michael Mitchell, first prize winner of two business class tickets to one of Emirates 39 European destinations plus a stop-over in Dubai. Second prize winner, Tracey Holmes, will receive an all inclusive two night stay at Emirates One&Only Wolgan Valley retreat. Watch the 2016 Bradman Gala Dinner tribute to Bill Lawry here. 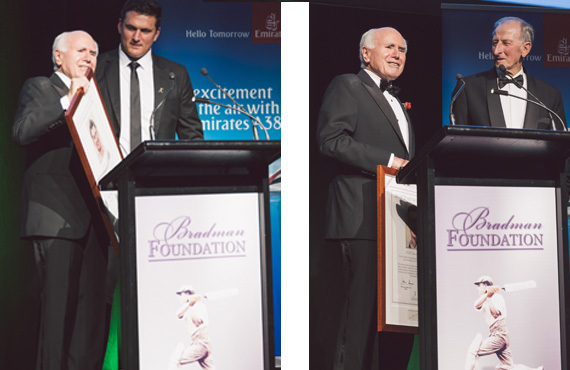 Watch the 2016 Bradman Gala Dinner tribute to Graeme Smith here. Last year we witnessed South Africa’s record-breaking Captain, Graeme Smith and our own much-loved Bill Lawry inducted as Bradman Honourees. Once again the presentation of the awards was both memorable and meaningful. Master of Ceremonies Mark Nicholas and our Patron John Howard combined seamlessly with sophistication, humour and respect to capture the cricketing achievements and personalities of our two Honourees. Graeme, accompanied by his parents Graham and Janet, was moved by the Bradman Foundation’s recognition of his achievements. In South Africa he is largely uncelebrated and he has simply moved on from his stellar playing career into a business career. To have his parents in the room, at the SCG – the scene of many of his great on-field battles, was a highly significant moment in his life. Similarly, Bill Lawry after a lifetime of playing cricket leading his State and National side followed by a lengthy and distinguished broadcasting career proudly accepted our award with both humility and an impish sense of humour. He was especially pleased that his two daughters Susan and Elizabeth were present to witness their father’s acknowledgment. In response our audience were once again closely engaged by the on-stage presentations throughout the night. Their attentiveness and palpable goodwill towards all speakers greatly contributed to the collegiate atmosphere by which the Bradman Dinner is now defined. Our fundraising success was underpinned by the ongoing support of our event partners Sydney Cricket Ground Trust, Wide World of Sports, Carlton United Breweries, Tyrrell’s Wines, Emirates Airlines and Investec. The room was beautifully presented with 75 photos of guests from previous years archives and match footage from yesteryear which was shown between the onstage segments.